A Fairy-tale Ending in Paperback! My apologies for being away so long. The entire month of October seemed to assault me on multiple fronts. However, I made it to November. 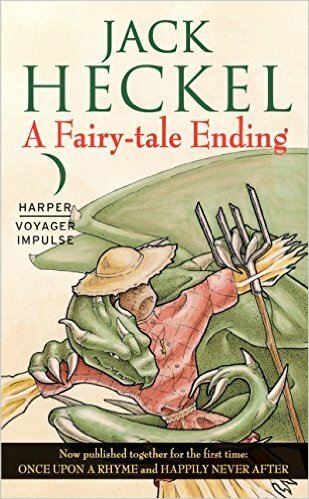 In the meantime, Once Upon a Rhyme and Happily Never After were published together in paperback as A Fairy-tale Ending. While Barnes & Noble isn’t stocking it on its shelves (yet), it’s available to order through them or better yet, through your local independent bookseller. I can’t emphasize how important those stores are to authors, especially less well-known names. I’m attempting to arrange a signing in my area at Fountain Bookstore. If you pre-ordered Pitchfork of Destiny in ebook and discovered that your pre-order was canceled by Amazon – don’t panic. I’ve been assured by my editor that they just had to move the date, so expect to see it in 2016. I’m intending to update this blog and the Jack Heckel blog as soon as I receive news. Additionally, I am working on National Novel Writing Month, but I’m ridiculously behind this year. I’ll do my best to update as I go. I’ve completed a novel every year since 2009, and I have no intention of letting this one pass by. I’m also working on the next Jack Heckel book – The Dark Lord, and I’m making that my top priority. There’s lots going on that I’d love to comment on, especially since we finding ourselves living in the world of superhero tv shows. I was surprised by how much I enjoyed Supergirl and more importantly, I’m impressed by how much my daughter likes it. It’s the second weekend of Nanowrimo, and I’m diligently working on my novel. Currently, it’s at 10,709 words. The good people at nanowrimo.org do an excellent job of keeping stats and helping writers track their progress. By midnight tonight, I need to be at 15,000 words or more. Am I concerned? Yes. Am I panicked? No. 50,000 words of total writing madness in 30 days, all the while dealing with everything that life throws at you. Plus, this year, I have an extra challenge or two – new book proposals and writing on Book 3 of the Charming Tales. I’ve done it every year successfully since 2009. I certainly don’t want to stop now. I always tell people who want to try that whether you succeed in writing 50,000 words in a month or not, you will certainly have more words than you started. I believe that. When I first tried Nanowrimo, I failed utterly and ended with only 8,000 words or so. That failure eventually turned into Souls of the Everwood, my first Krueger novel.